In order to get to Chavarillo we took first a bus to Las Trancas, just outside of Xalapa. When we got off in Las Trancas we had to wait just a little, and Esme and I bought something from a Panadería (bakery) for breakfast since we had only had coffee at our house. After a few minutes the bus to Chavarillo arrived and we were on our way. 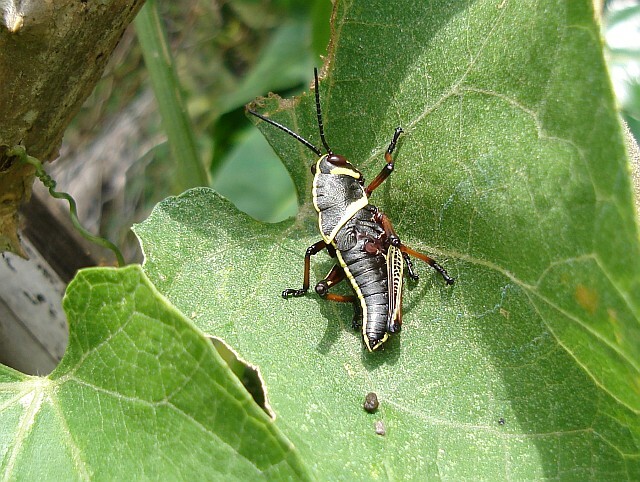 A black with yellow grasshopper. We got off the bus near the town park, and we first went to a shop to buy some drinks. Since we couldn't find the drinks we normally buy, and the alternative seemed to be something bubbles, or bottled water we decided to take 4 bottles of water with us. We had no problem in finding back the road we took on our first trip to Chavarillo. Esme halted to change her shoes, and I took a picture of a black with yellow grasshopper. 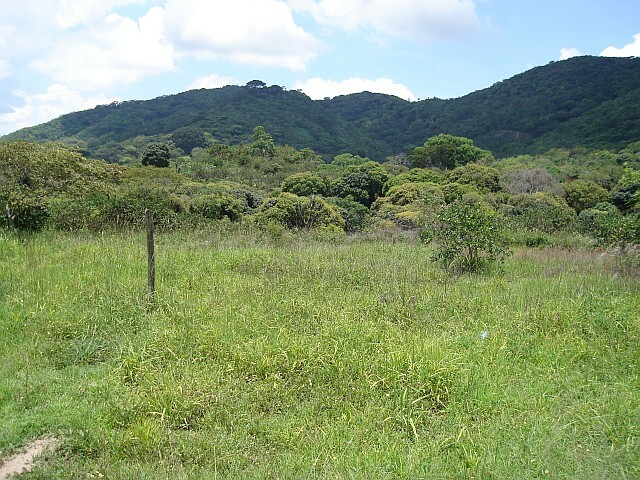 Some of the green hills near Chavarillo. We followed a small dirt road with to the right some lemon trees growing. 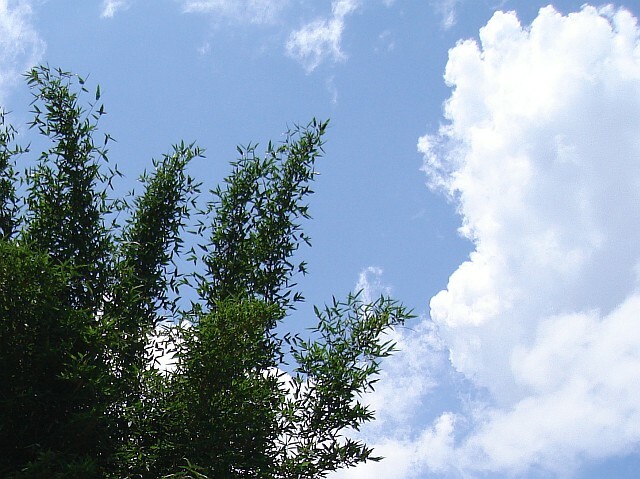 After a short walk we recognized the landscape, especially since there was a huge bamboo plant growing. Esme and I kept following the track we had taken on our first visit when we came back. We saw lemon trees, coffee plants and banana plants here and there. It was quite hot, but soon we would go down in the barranca (canyon) with a lot of shadow. Lemon tree, in the background coffee plants and a banana plant. 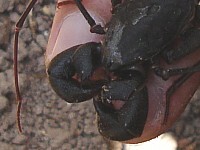 I looked under stones, not expecting scorpions since on our earlier visits we had found none "above" the barranca. 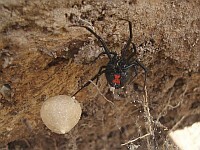 Under one stone I found a fat female black widow spider with egg sac, so I took a few pictures. 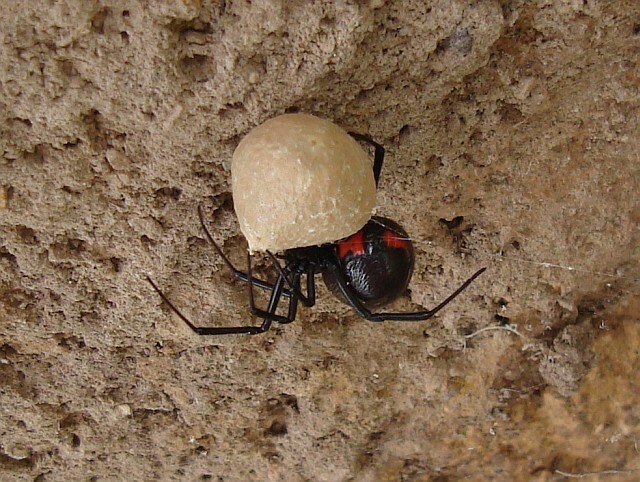 Female Mexican black window spider (Latrodectus sp.) 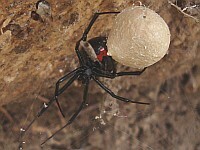 with egg sac. 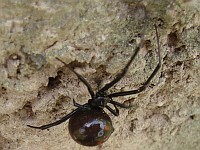 Some other pictures I made of this black widow spider. Click a thumbnail to see the entire and larger image. Under the same stone I also found the leftovers of a meal, probably caused by the black widow spider. 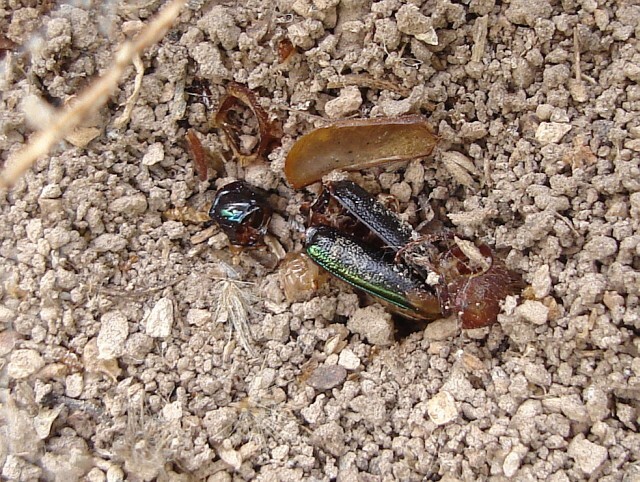 Leftovers of a meal, probably caused by the black widow spider. After the short photo session, I carefully put the stone back into its place, and we moved on since I wanted to go down into the barranca as soon as possible, and look for scorpions. We kept following the road, and the quite green landscape got more and more dry. 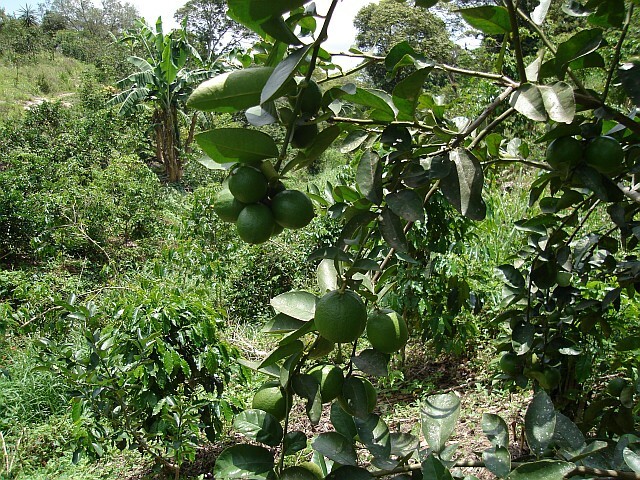 We saw more coffee plants, with here and there a lemon tree. Somehow we had taken a wrong turn earlier on, since we hadn't arrived at the barranca yet. 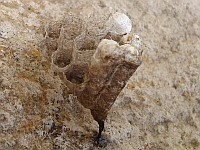 When I looked under a stone I saw what looked like a wasps' nest. 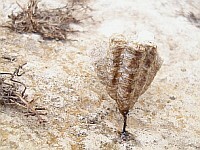 The larvae were clearly visible, each in its own cell. 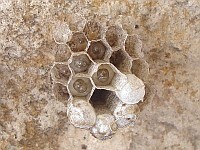 Pictures of a wasps' nest. Click a thumbnail to see the larger image. I kept looking under stones, somehow hoping to find a scorpion, although on our first visit we had found none "above" the barranca. Under a large stone close to a coffee plant I saw a snake. 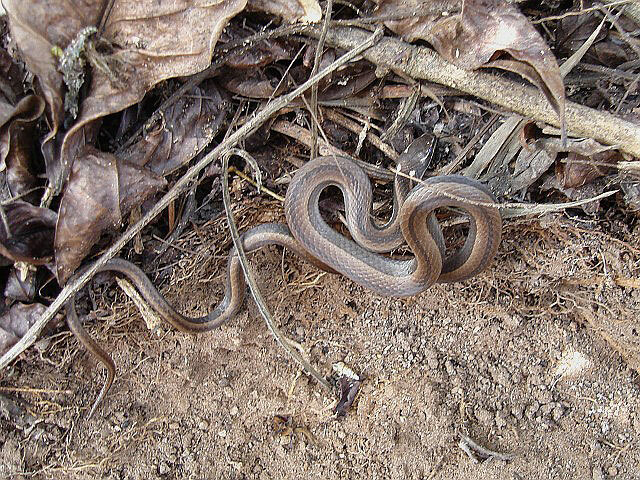 Coniophanes imperialis, the Black-Striped snake. At the time of writing this entry both Chris Harrison and Tim Burkhardt have indentified the snake Esme and I saw as a Coniophanes imperialis (Black-Striped snake). I was only able to take one picture when I managed to get it out of a hole between a few roots using a stick. The snake was very fast, and clearly not interested in a photo session. 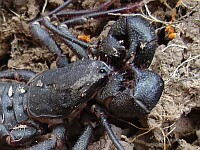 Pictures of a whip scorpion (Uropygid sp.). Click a thumbnail to see the entire and larger image. 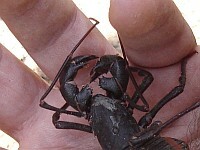 Shortly after this fantastic find, I found a big vinegaroon (whip scorpion), hiding under a large stone. 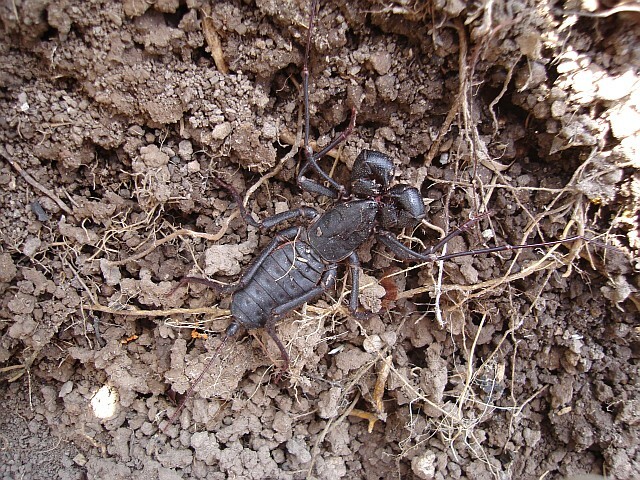 I have seen whip scorpions before in Mexico but I was quite sure that this was the largest so far. I had no problem taking the animal on my hand for a few photos. 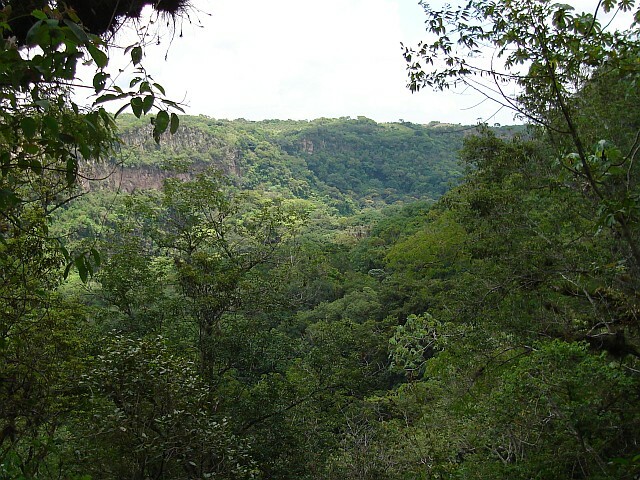 The barranca (canyon) near Chavarillo. 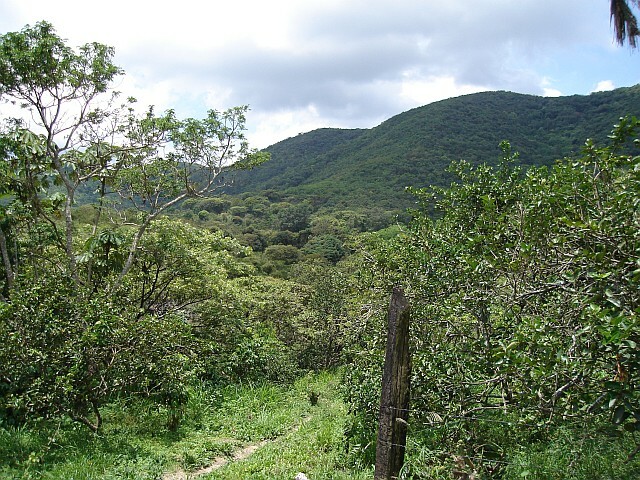 We continued our walk between coffee plants, looking for the track we had taken on our first visit, and the edge of the barranca. After about 10 minutes we had found the barranca and the way down. Read the next part of this blog entry in: The descent into the barranca.